We have discussed tasting this beer for many days but we needed Ms. Amber to be present when reviewing stouts, here she is... The Mephistopheles pours a black murky body with a dark brown creamy head. With fair lacing on the glass, the mostly lasting head was very inviting. The nose detected a strong roasted malt presence with hints of citrus (pineapple) and fermented fruit. The initially harsh sweet taste was a little over the top. It quickly moved into a bitter finish with aspects of mocha and espresso for a long duration. The alcohol presence was very powerful and from our small samples we could feel the force. The force is strong. Medium to full in body, the softly carbonated Mephistopheles left an oily presence on the palate. 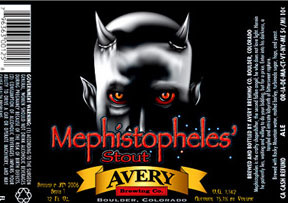 We enjoyed the Mephistopheles and strongly recommend to stout fans. Those who appreciate a stout will not be disappointed. The mid-level carbonation provided a Kat with a 'tingly tongue', and George with a taste eruption across his tongue from front to back. This spirit, which at 16% carries more than one meaning, has many faces, as it displayed a variation of aromas from pour to pour, as we divided it between eight glasses. Strange note: Kristen's favorite Police song contains the word �Mephistopheles�. Reviewed on July 5th, 2007.